Helen K. Caughlin of Tonkawa entered into eternal life surrounded by her family on May 30th, 2017. She had recently celebrated her 80th birthday with a surprise birthday party. The daughter of John Francis and Helen Minnie Schmidt Wanko, Helen Kathryn was born on December 22, 1936 in Ponca City. The oldest of 7 children, she grew up on the Wanko family farm, west of Newkirk. She received her early education from St. Francis of Assisi Catholic School and Newkirk High School. She attended Northern Oklahoma College and Oklahoma State University graduating in 1960 with a degree in Home Economics. While raising a family, she attended Newman University receiving her Pastoral Ministry degree in 1988. Helen’s passion was to serve her church and family. Her faith was evident to everybody that knew her. 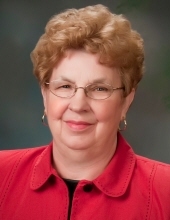 She actively served on the St. Joseph Parish Council, Alter Society and diligently served as the Director of Religious Education for 31 years and in many other capacities at the church. “Grandma Helen” always made time for whatever family member was in need; raising her granddaughter Melanie as her own for many years, driving wheat trucks, cooking a meal, and she loved her weekly trips to Enid to babysit her great grandchildren, get her nails done, and shop at Jumbo’s for fruits and vegetables. Helen married Donald Joseph Caughlin on February 11, 1961 at St. Francis Catholic Church in Newkirk. She is survived by her sons, Timothy and Sandra Caughlin; Phillip and April Caughlin all of Tonkawa; grandchildren: Melanie and Jay Bellinghausen of Enid, Michael, Danny, and Randy Caughlin, Nathan and Maria Caughlin; great grandchildren, Wyatt and Addison Bellinghausen. She is also survived by 4 siblings, Liz and Gary Maupin; Mary Schuchman; Lewis and Vineta Wanko; and John Wanko, all of Newkirk and a large extended family. She was preceded in death by her husband Donald; son and daughter-in-law, Mark and Janelle Caughlin; grandson, Patrick Caughlin; her parents; brothers, Larry Wanko; Donald and Wanda Wanko, and brother-in-law Ronald Schuchman. A vigil will be held Sunday, June 4th at 7 p.m. and the Mass of Christian Burial will be celebrated Monday, June 5th at 10 a.m. with Father Ben Lwin, main celebrant assisted by Deacon Bart Brashears. Both services will be held at St. Joseph Catholic Church in Tonkawa. Burial will follow at St. Mary’s Catholic Cemetery in Ponca City. Contributions may be made in Helen’s memory to the St. Joseph Church Building Fund, P.O. Box 525, Tonkawa, OK 74653. Arrangements are under the direction of Trout Funeral Home. To send flowers or a remembrance gift to the family of Helen Kathryn Caughlin, please visit our Tribute Store. "Email Address" would like to share the life celebration of Helen Kathryn Caughlin. Click on the "link" to go to share a favorite memory or leave a condolence message for the family.